John Skipper has stepped down from his position citing a substance abuse problem. 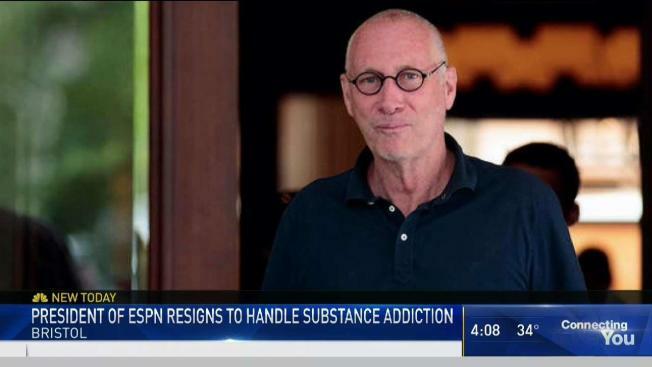 ESPN President John Skipper is resigning from his position, citing a substance addiction problem, according to a statement from the network Monday morning. Former ESPN president and executive chairman George Bodenheimer, who worked at ESPN from 1981-2014, will serve as acting chair of the company for the next 90 days and oversee the transition process, according to the statement from ESPN. “Today I have resigned from my duties as President of ESPN. “I have had a wonderful career at The Walt Disney Company and am grateful for the many opportunities and friendships. I owe a debt to many, but most profoundly Michael Lynton, George Bodenheimer and Bob Iger. “I have struggled for many years with a substance addiction. I have decided that the most important thing I can do right now is to take care of my problem. “I have disclosed that decision to the company, and we mutually agreed that it was appropriate that I resign. I will always appreciate the human understanding and warmth that Bob displayed here and always. “I come to this public disclosure with embarrassment, trepidation and a feeling of having let others I care about down. “As I deal with this issue and what it means to me and my family, I ask for appropriate privacy and a little understanding. “To my colleagues at ESPN, it has been a privilege. I take great pride in your accomplishments and have complete confidence in your collective ability to continue ESPN’s success." Bodenheimer released a statement, saying he has “great respect” for Skipper’s leadership. “I have great respect for John’s leadership and applaud the courage he’s demonstrating by addressing the challenge head on. The most important thing right now for John and his family is that he conquers his addiction and the entire ESPN family is behind him,” Bodenheimer said.